Enjoy the smooth fast, familiar feel of traditional writing in a versatile digital format, with a variety of colors, styles and widths available. Up to 4 people can write simultaneously, using almost any object as a writing tool. You can also quickly clear either a small section or full screen worth of content using a hand swipe motion. Through the Flip's broad connectivity, you and your team can share and make notations within a variety of content files, all maintained at optimal visual quality. The Flip's intuitive, user-friendly menu simplifies navigation and reduces the time required to access controls or view content in its entirety. Facilitators can also preview individual content pages and make instant changes directly on the screen. Now you and your teammates no longer need to sort through endless stacks of paper to find a specific discussion point. You can seamlessly scroll through and search within up to 20 clearly-divided digital Flip pages for greater efficiency. Ensure that your game-changing ideas remain in the right hands through a reinforced data security system. Each in-office team can set a unique numeric password to lock the display and remove critical content from view. Connect your personal compatible devices with the Flip for interactive content visibility, notation and sharing. You can connect a PC, compatible tablet and phone or USB storage device via HDMI, USB, screen mirroring, wireless (Windows 10) or NFC. The Touch Out Control functionality allows you to sync your personal compatible devices to the Flip for real-time viewing and control. Changes made on the Flip will automatically transmit to your personal device, and vice versa, for efficient, matched viewing. Adjust to varying huddle room dynamics without sacrificing comfort. Featuring a versatile pivot mode and ergonomic stand (STN-WM55H), each Flip interactive display can configure to a portrait or landscape orientation to match your collaborative needs. Additionally, the Flip can tilt 4.5° when in portrait mode for a more natural writing angle. Any meeting participant knows the frustration of capturing and sending handwritten recaps. The Flip relieves this burdensome process. Save conversations and critical content within the display's central storage, and easily share with your colleagues through mobile and digital channels. InGlass™ touch display technology helps to ensure real-time feedback and speeds without delay. 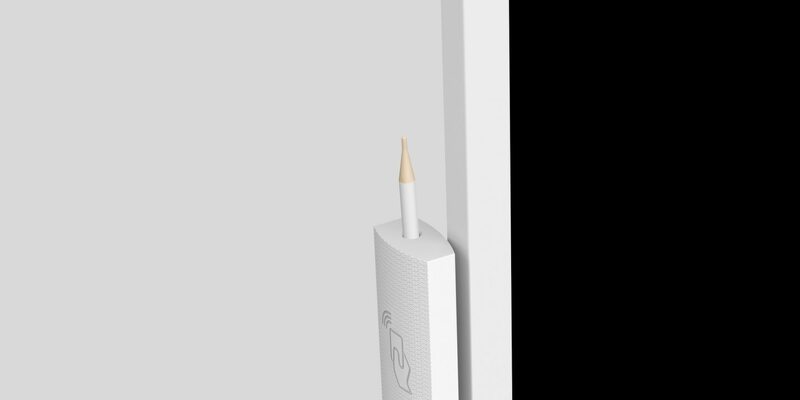 This allows you to experience smooth writing or drawing, virtually equivalent to that of working on traditional paper. The Flip’s sleek, gray design helps to position any office environment as sophisticated and forward thinking. With an ergonomic tilt of 4.5° and a spacious front tray and pen holder to house essential meeting tools, you and your team can stay comfortable and organized to focus on what’s important for your business. For businesses with limited collaborative areas, the Flip helps to elevate any personal office or available room into a fully-functional huddle space. A portable, wheel-based stand empowers you to start a meeting in any location at anytime. *The STN-WM55H Stand is designed specifically for the Samsung Flip, but is sold separately. Please be sure to order both the Samsung Flip and the stand. The Flip maintains consistent and clear UHD picture quality regardless of the surrounding environment or use case, introducing more powerful and compelling visuals to the meeting room. Stop worrying about lost or erased handwritten meeting notes. Backed by the powerful Tizen 3.0 operating system, the Flip offers extensive, centralized space to store meeting content. Additionally, Tizen 3.0 provides you and your team with an intuitive interface to locate and view saved materials. Start your meetings on time and without a lengthy boot-up. Embedded sensors activate the Flip display as you approach the screen, pick up a pen or rotate between portrait and landscape modes, allowing you and your colleagues to seamlessly launch a new discussion or resume where you left off.